Het Utrechts Archief (Utrecht's Archive) is the provincial archive of Utrecht and also maintains the municipal archive of Utrecht City. Address: Postbus 131, 2500 AC Utrecht, The Netherlands. Phone: +31 30 286 66 11. E-mail: inlichtingen @ hetutrechtsarchief.nl, or use the contact form on the website. Oud Utrecht (Old Utrecht) is a historical society for the province Utrecht. Internet resources Utrecht, an index to the many available online resources for Utrecht. 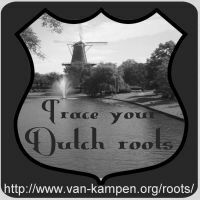 FamilySearch, the website of the LDS (Mormons) has many Utrecht records and scans. Beeldbank stad en provincie Utrecht (Image bank of the city Utrecht and of the province Utrecht). In Dutch. Graftombe has indexes of many cemeteries in Utrecht. Register to order photos of tombs. Online Begraafplaatsen (Online Cemeteries) has images of tombstones of several cemeteries in Utrecht.